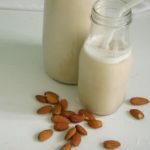 Clever Almond Milk – – almond butter, water, Blend ingredients in a high speed blender to make the milk. Add more or less almond butter to get your desired consistency. ; – You can use any nut butter to make a milk in this way. Add maple syrup or dates to make a sweeter almond milk. Blend ingredients in a high speed blender to make the milk. Add more or less almond butter to get your desired consistency. You can use any nut butter to make a milk in this way. Add maple syrup or dates to make a sweeter almond milk.